Do vampires say boo (maybe mwahahaha)? Or do only ghosts say boo? Anyway, this vampire says boo ( I didn’t have a stamp that said mwahahahha). 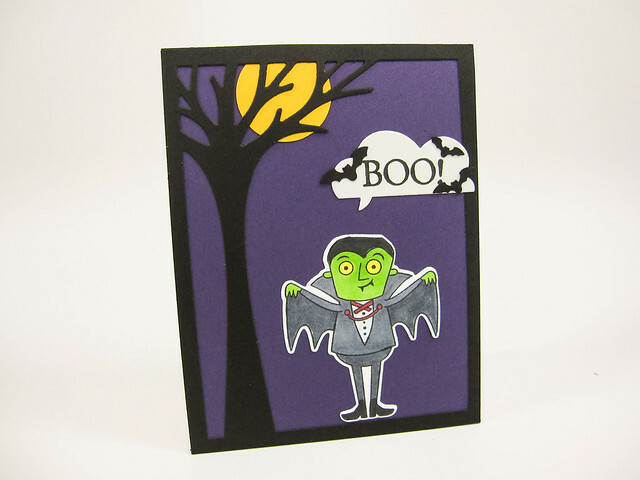 This is a whimsical card for Halloween. I created it using products from several of my favorite stamp companies. Please refer to the list below for all the supplies I used. I think the results are fun! It only goes to show that you can make a funny card using a variety of products from different brands and they will all come together just fine. I made 15 of these puppies and gave them to family and friends for Halloween. The silhouette of the tree is a die from Lawn Fawn, while Dracula is from My Favorite Things. The moon was cut using a 1.25” circle punch from EK Success. I was too tired to run a circle die through my die-cut machine, so I used my trusty punch. Sometimes the low-tech approach is the way to go, especially when you want to give your die-cutting machine a rest. The bats flying around were also cut from another EK Success punch that had 3 bats in different sizes. Anyway, construction of this card was fairly easy. The time-consuming part was coloring 15 Draculas. I used Copic markers to color Dracula, using various shades of cool grays for this. I know Dracula is usually dressed in black, but you lose detail when you color in black and I’m not that adept at coloring with Copics like Sandy Allnock. She is a great teacher when it comes to showing you how to use Copics. I try to be a good student, but a good student does their homework, which I sadly must admit—don’t do enough of–but I’m getting there! Hope you all have a fun and safe Halloween! 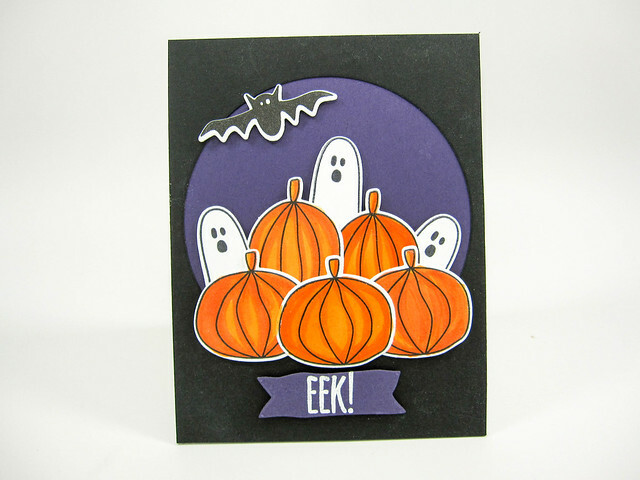 Stamps: My Favorite Things: Frightful Friends (vampire); Hero Arts: Happy Halloween Greeting Stamp Set (CL353 – obsolete unfortunately). Dies: MFT Die-names: Fright Friends (companion dies to Frightful Friends stamp set); Lawn Fawn: Leafy Tree Backdrop: Portrait. Ink: Memento: Tuxedo Black (for image); Versafine Onyx Black (for sentiment). Cardstock: Neenah Solar White 80# (for stamping vampire/Dracula); Papertrey Ink cardstock: True Black, Royal Velvet, Summer Sunrise. Other: EK Tools: Circle Punch 1.25” diameter; EK Tools Paper Punch: Bats. 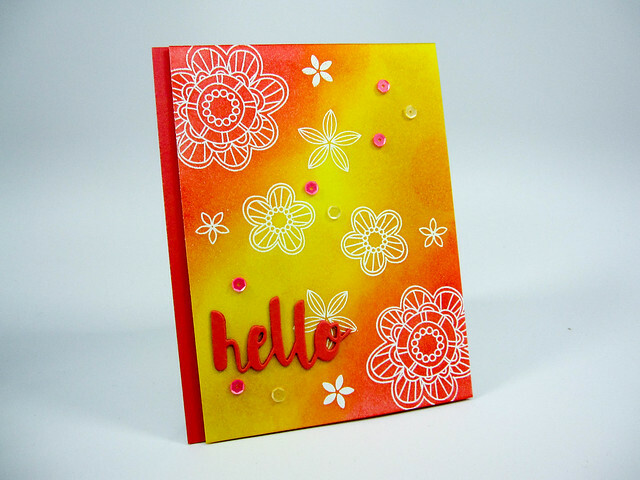 Love this stamp set Watercolored Anemones by WPlus9 and its matching set of dies. There are many different stamp pieces for each of the individual flowers and leaves. This only gives all the images more depth and dimension if you care to use all the layers. I have been playing with this set for a while trying to get the hang of layered stamping. I know everyone else is way ahead of me in their layered stamping techniques.I tend to worry that my stamping of the layers is always a little bit off, but I think that is also the beauty of layered stamping. For this card, I chose to simply focus on layering the flower images. I keep the background foliage simple by only stamping the major foliage image once in a mid-tone green. This card itself is a pretty straightforward design borrowing from the clean and simple style. The focal point is the flowers which I stamped in pretty pink/pinky coral shades. The flowers are place against a background of leafy bouquet foliage. The flowers have been inked, die-cut and then raised using foam tape to give the focal point added interest and dimension. A simple birthday greeting from the Altenew stamp set: Birthday Greetings completes the front of the card. The original card front was 4.25”x 5.5”, but was trimmed down to 4” x 5.5”. The card front was then matted to the right onto 4.25”x5.5” pinky coral cardstock using 3M foam tape. This in turn was mounted onto a top-folding A2 portrait-oriented card base. Sequins were added in a pink/coral color and a cream color. Hope you like this CAS card! Have a great day! Stamps: WPlus9 Watercolored Anemones; Altenew: Birthday Greetings. Dies: Wplus9 matching dies to Watercolored Anemones stamp set. Inks: WPlus9 dye inks (listed from lightest to darkest): Little Piggy, Sweet Nectar, Sweet Gelato for flowers and New Leaf for background foliage. Cardstock: Neenah Solar White 80# for card front; Papertrey Ink: Berry Sorbet cardstock (100#) for matting for card front; Neenah Solar White 110# for card base. Others: Neat and Tangled Sequins in Cotton Candy and Buttercream. For the SSS ‘s Resist Flickr Challenge #56, I chose to use an embossed resist technique with Distress Inks. I first stamped my floral images in Versamark ink and then heat embossed the images using white embossing powder. To create a more autumn look, I used 3 Distress Inks for an ombre effect. The ombre effect was created at a slight diagonal across the card front. I started with Abandoned Coral distress ink in the upper left-hand corner, then blended Squeezed Lemonade and finally Wild Honey to finish midway. I then started to blend using Squeezed Lemonade at a diagonal across the second-half of the card and finished with Abandoned Coral at the bottom right-hand corner. I kept blending and adding more color as needed across the entire front of the card until everything looked blended. I added sequins in pink and cream to the card as well. These sequins were from my stash, but I think they are from Neat & Tangled. When I assembled the card, I cut down the card front to 4” x 5.5”, and placed 3M foam tape all over the back to raise the panel. I then matted this against an A2-sized piece of cardstock in a cardstock color that picked up the pinky/coral hues in the card front. This in turn was mounted onto a top-folding, portrait-oriented, A2-sized card base. Hope you like the finished product! Have a great day! Cardstock: Neenah Solar White 80# for card front; Stampin’ Up cardstock in Regal Rose (now obsolete) for matting for card front; Neenah Solar White 110# for card base. Others: Neat and Tangled Sequins in Cotton Candy and Buttercream; Hero Arts White embossing powder, 3M foam tape. The October, 2016 Ellen Hutson Mix It Up Challenge requires the use of any Pinkfresh Studio product with any Essentials by Ellen product. I LOVE Pinkfresh patterned papers. Pinkfresh’s style is very modern, whimsical and graphic. Their latest patterned paper release, Indigo Hills is a great example of this. I chose a piece of Pinkfresh’s 6×6 patterned paper that had graphic flowers along the bottom of the paper and paired it with Essentials by Ellen’s some flower dies from the Wild Garden die set. 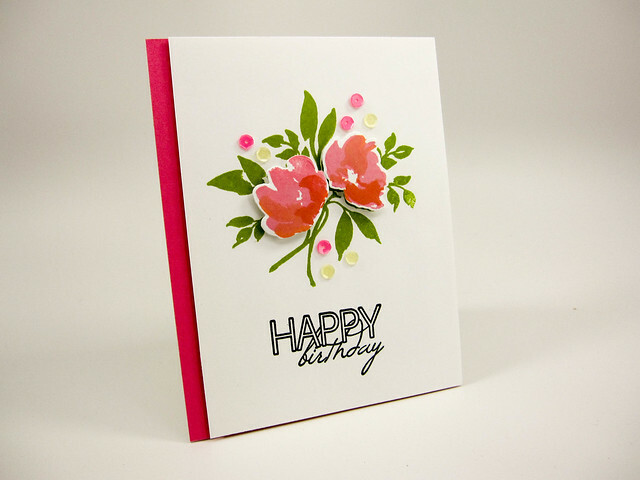 Several flowers were die-cut from the set and were added to the Pinkfresh patterned paper to further emphasize the graphic flowers on the paper. I used 2 different flower dies from the Wild Garden. For added dimension, I cut each flower three times using WPlus9’s Coal Mine cardstock (a charcoal-color) and adhered the three pieces on top of each other to create thicker, chipboard-like flowers. Since the patterned paper was 6-inches square, I trimmed it down to a 5-inch square. I stamped a sentiment from the Essentials by Ellen sentiment set, Lovely, in the upper right of the square. I then arranged the chipboard flowers onto the card front to fill in the open areas and balance the pattern. I used a glue pen to adhere the flowers. Pretty Pink Posh sequins in Charcoal (4mm and 6mm) were added as well. I then cut a piece of the same WPlus9 charcoal cardstock to make a top-folding, 5.5-inch square card base. The card front was adhered to the base. Overall, I really liked the end result. The results looked cohesive. The two different brands and the patterns and elements I chose were very complementary. I loved the use of charcoal and grays in this project. 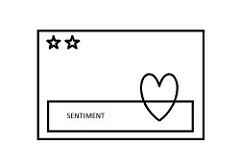 Stamps: Essentials by Ellen: Lovely (for the sentiment). Inks: Tsukineko VersaColor pigment ink in Charcoal. Other: Pretty Pink Posh Sequins: Charcoal (4mm and 6mm); Zig 2-way Glue Pen. I decide to use SSS Secret Garden stamp set to execute this challenge. I love the sweet little fairy in this stamp set. She stamps beautifully and the details of her flowing gown are so simple and delicate. To match the delicacy of the fairy image, I decided to use a soft blended background against the other elements in this sketch. To achieve this, I die-cut masks for the fairy and the banner from Inkadinkado masking paper. I placed the two masks on the card front where I wanted my images to be placed according to the sketch. I then created a soft blended background using Tumbled Glass Distress Inks around the masks so that background would highlight the sentiment banner and the fairy. For the fairy image, I stamped the image on a separate piece of cardstock in Copic-friendly ink (Memento Tuxedo Black) using my MISTI stamping tool. I stamped the image twice to make sure I had a good solid line image. I did the same for the two butterflies. • Hair: E13 and E17. Butterflies: Y06 (body), R22 (wings). After coloring all the images, I die cut them using the dies from the coordinating die-set for the Secret Garden stamp set. I raised and placed the images as you see above on the card front using foam tape. I then stamped the sentiment in the banner area using Versafine pigment ink in Onyx Black. The original card front was A2-sized (4.25”x5.5”). I cut this down a little so that the final size was 4.00”x5.25”. The card front was then mounted onto an A2-sized turquoise colored mat and then mounted onto an A2-sized, top folding horizontal-oriented card base. The card is soft and sweet just like the fairy image. Hope you like it. Have a great day! Stamps: Simon Says Stamp: Secret Garden. Dies: Simon Says Stamp: Coordinating dies for the Secret Garden stamp set; Simon Says Stamp: Sketch Banners die (larger of the 2 dies in the set). Inks: Memento dye ink in Tuxedo Black; Versafine pigment ink in Onyx Black; Distress Inks: Tumbled Glass. Markers: Copic (see above for the numbers). Cardstock: Neenah Solar White 80# (card front); Neenah Solar White 110# (card base); Papertrey Ink cardstock in Hawaiian Shores (mat for the card front). Other: Inkadinkado Masking Paper; 3M Double-Sided Foam Tape.